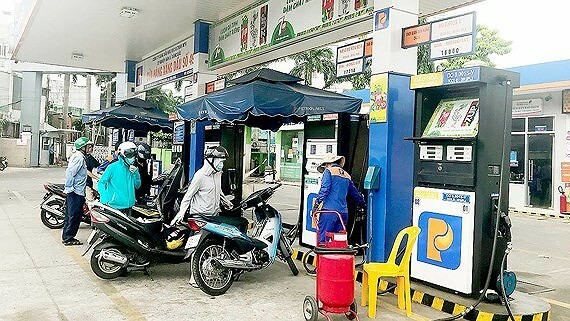 Only small fuel stations in Hanoi were hit by a shortage in RON95 gasoline supply while trading of RON95 gasoline was still normal at fuel stations of Petrolimex, reported by reporters of SGGP Newspaper. On March 27, the Domestic Market Department and Vietnam Directorate of Market Surveillance under the Ministry of Industry and Trade and the Hanoi’s Department of Industry and Trade inspected fuel stations which showed signs reading that they ran out of RON95 gasoline and strictly fined stations which violated regulations on trading of fuel. According to Mr. Tran Duy Dong, head of the Domestic Markets Department, the situation that some gas stations in Hanoi announced that they were out of RON95 gasoline was just temporary interruption. The RON95 gasoline supply is currently sufficient. For the past few days, Nghi Son oil refinery in Thanh Hoa Province has experienced technical issues so it has temporarily stopped production for a week, affecting RON95 gasoline supply. However, RON92 gasoline reserve for the making of E5 bio-gasoline maintained at regular level. During the time that RON95 gasoline production is being halted at Nghi Son oil refinery, the Ministry of Industry and Trade had a meeting with fuel distributors to discuss on importing gasoline to make up for a shortage in domestic gasoline supply. The ministry also reported this issue to the Government. Meanwhile, trading operation of Petrolimex remained as normal. On the same day, representative of the Ho Chi Minh City’s Department of Industry and Trade said that the department still has not received any information about scarcity of RON95 gasoline in the city. On the contrary, RON95 gasoline supply was reported plentiful and even abundant. The ministry continued to affirm that domestic gasoline supply is still enough for production demand and daily life of people. In case that supply from local refineries fails to meet demand, fuel distributors will seek for reasonable import source to ensure fuel supply for domestic market. On March 18, the ministry held gasoline prices by allocating the fuel price stabilization fund by up to VND2,801 per liter for RON92 gasoline and VND2,061 per liter for RON95 gasoline. With prices being pinned and fuel subsidy fund being heavily spent, gasoline distributors concerned over a drop in profits so they held back gasoline and provided gasoline in dribs and drabs for gas stations. Meanwhile, as gas stations were not only limited in gasoline imported volume but also saw a sharp decline in discount so they neglected trading of RON95 gasoline. In fact, this is a plot to create false scarcity to cause pressure so that fuel distributors are able to demand for a rise in prices. Once their demand is accepted, along with VND300 per litter collected from the fuel price stabilization fund, losses will turn to profits, they will no longer complain. According to Associate Professor – Doctor Ngo Tri Long, ministries should adjust fuel prices based on market rules and signals so as to not cause difficulties for both fuel distributors and consumers. Footwear industry has opportunities to expand export market as free trade agreements were signed or in the progress to be signed; however, in order to take advantage of these opportunities, the industry needs to tackle its shortcomings and improve its competitiveness based on the activeness of firms and the support of policies and representative organizations.